We’ve heard the term, “Behind the green baize doors”, but what exactly does it mean? You hear this reference most often in regard to servants and in old books. The brass-headed tacks holding the cloth down could sometimes be arranged in a decorative design. The cloth not only deadened sound but also absorbed kitchen odors. 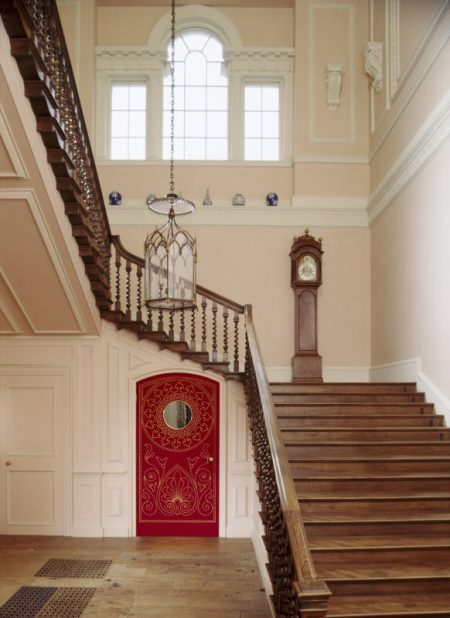 Green baize doors became popular during the mid-Eighteenth century, so Jane Austen must have been aware of the practice, which was more and more used as the 19th century progressed. During Victorian times the practice of sound proofing doors with baize was quite common. The cloth could also be used to insulate nursery room doors, bedroom doors, and doors leading to studies or any place where sound needed to be muffled. 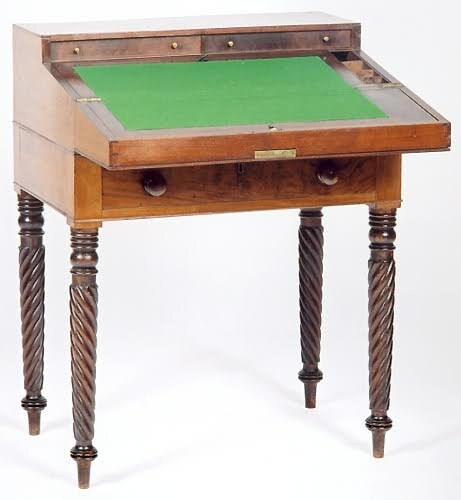 Baize was used in a number of ways, including as a protective cover for gaming tables, for the nap of the cloth increased friction, preventing cards from sliding and slowing billiard or snooker balls. The cloth is available in a variety of naps. 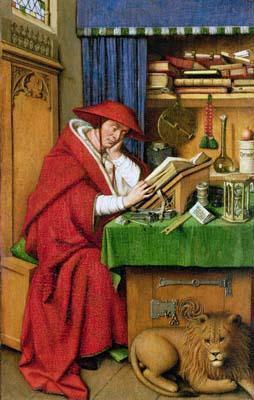 Roman Catholic churches used red or green baize for altar cloth protectors, and the cloth was used in museum cases and desks as well. As previously mentioned, baize was also used for clothing. The site for Knox Family Clothing mentioned mid-18th century receipts for baize and bayes, as well as rattinet, armozeen, dowles, buff battinet, flannel, linen, silk, and velvet. I think in Mansfield Park, they used Baize for the theatre curtain. I also think I rememebr Mrs. Norris taking it home with her.I hadn’t heard of baize coming in colors other than green before. Interesting post. You are absolutely correct, Jenny. I had meant to place these quotes from Mansfield Park in my article, and am glad you mentioned this. 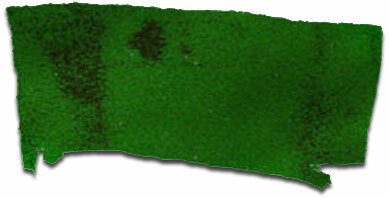 An enormous roll of green baize had arrived from Northampton, and been cut out by Mrs. Norris, (with a saving, by her good management, of full three quarters of a yard,) and was actually forming into a curtain by the housemaids, and still the play was wanting; and as two or three days passed away in this manner, Edmund began almost to hope that none might ever be found. Mrs Norris contrived to remove one article from his sight that might have distressed him. The curtain over which she had presided with such talent and such success went off with her to her cottage, where she happened to be particularly in want of green baize. I’ve see billiards tables with red baize rather than green. Excellent article! I was thinking the other night, as Branson paused before the green baize door at Downton Abbey, with his soup tureen full of nastiness, that not everyone would understand the significance of the green baize on that door. Now, thanks to your very detailed article, they do. Love your blog. You make the mundane of a household so much more interesting! I wonder what colour door seperated the male servants from the maids – and who kept the keys? Rumour has it that it was not infrequent for the master of the house and older male off-spring to have a copy of all the keys. This was interesting (as usual); the beginning is contrary to everything I’ve ever read about the dividing purpose of the door. It had been my understanding that the door prevented “upstairs” from hearing/seeing the servants and most significantly masked cooking odors and etc. I had read servants were to be not seen and not heard by their “betters”. Thanks as usual for another intriguing and thought-provoking post. 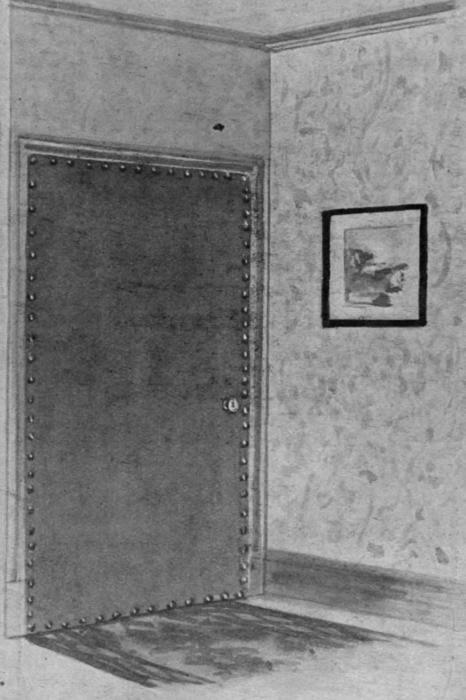 There was a green baize door in my family home 60 years ago; the door is still there I think but I can’t remember whether or not the baize is still on it. The servants are long gone! ‘baize, n. Etym: < French baies < Latin badius chestnut-coloured . .
1. a. A coarse woollen stuff, having a long nap, now used chiefly for linings, coverings, curtains, etc., in warmer countries for articles of clothing . . it was formerly, when made of finer and lighter texture, used as a clothing material in Britain also. 1578 in S. W. Beck Draper's Dict. (1882) 17 Blewe and blacke bayse. . . 1667 S. Pepys Diary 24 Feb. (1974) VIII. 79 A cloak of Colchester bayze. . . 1882 S. W. Beck Draper's Dict. 14 Bays, bayze, baize‥was first introduced here in 1561. Very interesting and informative, Vic. I’ve wondered about this for for years; thank you for clearing it up! Fantastic article about Highclere Castle. I definitely have to visit it during my next trip to England! In case anybody is interested in the clothing men wear at Downton Abbey, you should take a look at Lord Grantham’s clothing as well as the Mess Dress article. An old time crooner called Frankie Vaughn had a big hit in the UK (decades ago) with a record called “Green Door”, and his success was repeated years later by a guy called Shakin’ Stevens. Totally irrelevant, but thought I’d share it. Ralph and Ricki Lauren’s bedroom in their Bedford NY home is covered in deep blue baise and is beautiful. We visited Jane Austen ‘s museum in Bath, England. Interesting wardrobe…. The 1752 case for the London Communion silver in my church is lined with its original purple baize. Baize came in all colors. Any modern coarse-weave cloth is acceptable.